a magical elf comes to visit our house! The magical elf has been visiting our family since I was a little girl! 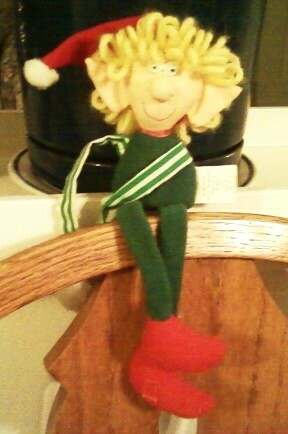 He would sit on the shelf in our living room, and watch us, making sure we have been nice all day long! It was definitely extra motivation to be good, knowing that you had your own personal elf to report to Santa! ﻿﻿The magical elf at our house arrives on the shelf in our living room, but where we'll find him later, nobody knows! 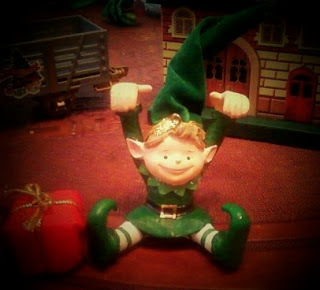 ﻿When night falls and all are snuggled quietly in their beds, the magical elf comes alive! He flies to the North Pole to report to Santa all of the activities for the day, and if the children in the house have been good or bad. He checks Santa's naughty and nice list, and if the children are on the naughty list, he pleads to Santa why the children deserve to be on the nice list. He reports back to the North Pole every night and returns in the morning before we wake up. Upon waking, the children pop out of bed and are anxious to see if the elf visited the North Pole while they slumbered. If he is not where he was when they went to bed the night before, they know he has visited Santa! They search around the house to see where he is hiding after returning from the North Pole. Our magical elf is SO silly! We have found him in places such as: sitting on top of the fish tank, in the refrigerator, on the breakfast table waiting for the children to wake up, in the hallway, in the bathroom, next to the children on their pillow!, and many more silly places! He makes us laugh every morning the silly places he chooses to sit! ﻿﻿Having a magical elf at our house has been very convenient! Because he visits Santa every night, my 7-year old daughter leaves a note for him to take to Santa. My 5-year old son has even drawn Santa a picture or two. Every morning when they awake, the notes and pictures gone, and the elf has returned. It is so much fun for them to know that Santa has received their letters and pictures! We are even hoping that one of these nights, if Santa is not too busy loading his sleigh, that he will even write them back! We would love to hear some of your cherished holiday traditions at your house! Email us at contact@enjoyutah.org, and maybe even send us a picture or two! We would love to feature the different traditions Utahns cherish! I forgot about the elves. My parents did that for me as well.